SAGITA COM - CyberLink MediaShow 6 adalah aplikasi untuk mengatur, mengedit dan berbagi foto dan video, diterbitkan oleh CyberLink Corporation. CyberLink MediaShow Ultra 6.0.5225 Final memungkinkan Anda untuk bekerja dengan gambar digital yang diperoleh dari hampir semua sumber. MediaShow memungkinkan Anda untuk dengan cepat dan profesional mengedit foto digital, mengoreksi kelemahan seperti kurangnya eksposur dan pencahayaan yang tidak merata, dan mengatur kontras, dll. Built-in one-Clicks tools to improve image and video. Cancel all the acts committed in one click. Change in skin interface in real time. 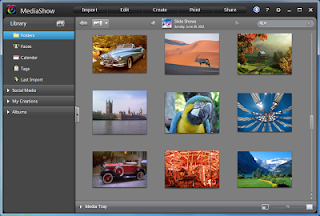 Easy import of your pictures and video files. Import video files from DV and HDV. Importing video and images from digital cameras and mobile phones. Importing video and images of these directories and drives. Instantly search all videos and photos by tags, creation time, and descriptions. Managing, enhancing and sharing your photos and videos. Mark selected videos and photos with asterisks. Preview in real time during editing. Quick search your media library. Use a different video to your videos. 3 GHz processor1 GB RAM. 1024 x 600, 16-bit color or above.